Waterproof jackets and raincoats. Among the strongest trends in fashion this year we can include the waterproof jacket and raincoats. Their return has been notified since the last autumn-winter’s catwalks, but it is on the current season and the next one that will be a huge deal. Personally I’ve added to my shopping list as waterproof blue duster trench long to the feet as I spotted last week at Dior’s fashion show! Back to us, for the summer season I decided to get myself a waterproof windproof jacket in a nice print. It is a waterproof jacket with hood with the rainbow by RED Valentino, perfect to restore the good mood in the dark rainy days. Being light, I decided to wear underneath a beautiful wool sweater and I completed the look with a pair of flared degrade jeans. I think it will become my favorite jacket for all my summer trips because it is perfect to carry in your bag and always have with you! For the shoes I wore a pair of platform shoes, very comfortable. 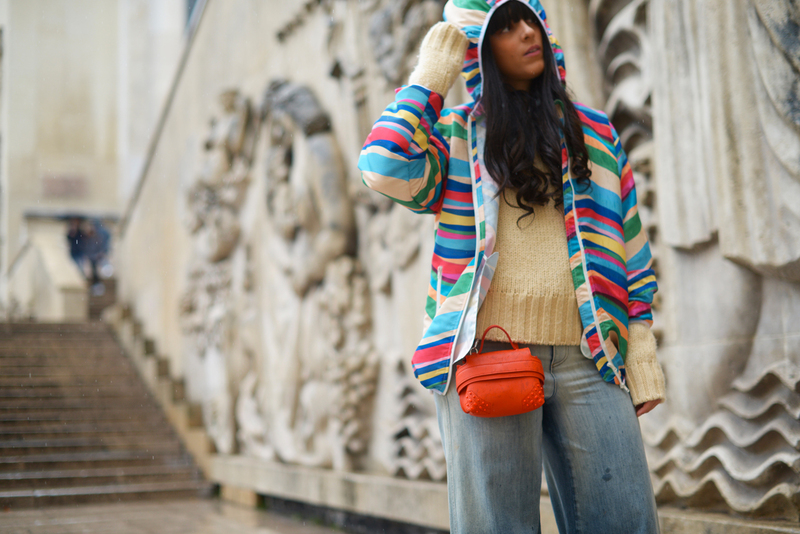 I added a touch of color with the Wave Bag by Tod’s in orange leather, worn over the shoulder! 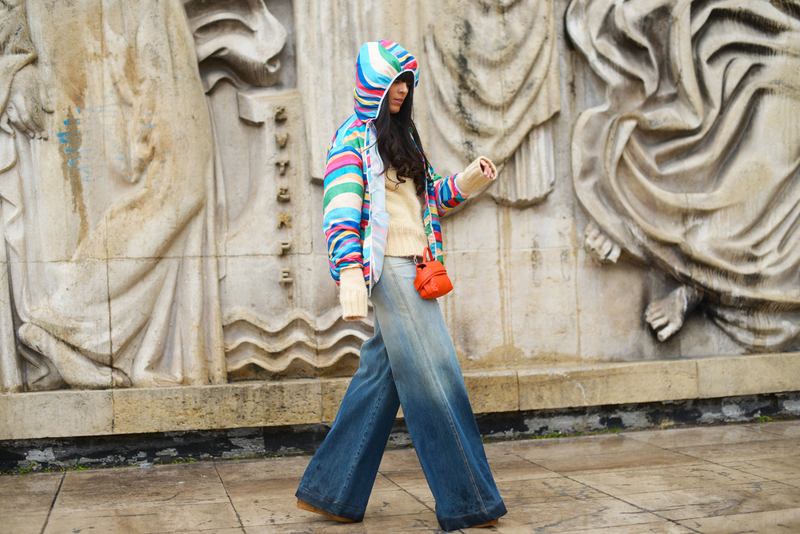 This is the look that I wore in the third, super rainy day of Paris Fashion Week. Event of the day was DROMe fashion show, where they have won me the wonderful sleeves: puffy, ruffled or decorated with tiny bows. The look made in the mix of fabrics such as silk, leather and velvet were really interesting! What do you think of my waterproof jacket? This 2017 fashion trend has already conquered you? Happy Monday and happy start to the week to you all!